this is a major step in our friendship here......you're either going to say, "hey, this girl's ok" or "this girl is a hippie nut job". Believe me, had you told me a few years ago I'd be making my own yogurt, I would have laughed in your face while scarfing down my light strawberry cheesecake Yoplait. It was like Christmas Eve. I didn't sleep.....at all. I had my alarm set a little bit earlier than usual so I had extra time before the school rush.....but I didn't need an alarm. I was up all night watching the clock. I jumped out of bed.....and then paused. What if it didn't work? I was nervous. I was excited. I made the journey in to the kitchen (oh.....about 10 steps), and peered in the oven at my cozy concoction, wrapped in a towel, basking in the warm oven light. c) how incredibly easy (and cheap!) it was. 1. Pour milk into pan, bring to boil. 3. 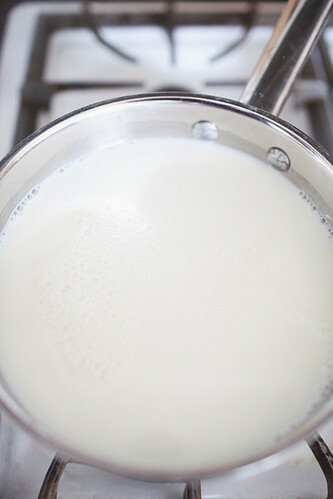 When milk begins to boil, remove from heat and let cool to between 100°-105°. 4. 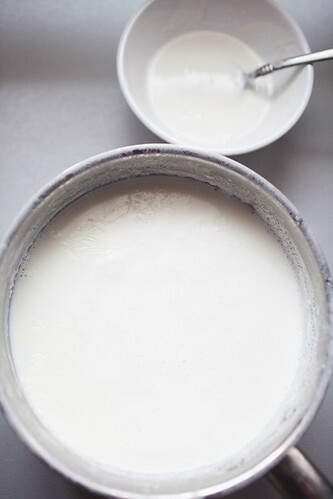 Once milk has cooled, remove skin from top, and stir in yogurt/milk mixture. 6. Let sit (keeping oven light on) for 16 hours. 8. Line a colander with two layers of cheesecloth (you can find it in the hardware section of any store that sells paint:), and pour your yogurt into the colander, letting it strain for 6-8 hours, until desired thickness is reached. Let me tell you......this stuff is AMAZING. It is so rich and creamy, and incredibly mild compared to regular plain yogurt....it's not so tart. Stir in a teeny bit of maple syrup (really, just a drizzle) and you feel like you are eating dessert. Add fresh fruit and it is heaven! Ease: Easy peasy. It's basically just waiting around for it to make itself. Price: I cannot tell you how amazing this is until you try it. I LOVE Greek yogurt.....but really, that stuff is expensive! This is the price of milk. And now I can continue to use my homemade yogurt as my starter. Taste: Do you like yogurt? Make this NOW! It's the best! Will I make it again? I already have. I just strained my second batch (this time I did 1 gallon of milk's worth + 8TBS yogurt). Other completely home made things I've done (like graham crackers and thin mints), I've done for fun, just to try it out. I hope that yogurt will become part of my weekly routine. You can't beat the price, or the taste! Also, yogurt is so SO good for our bodies to have (when it's not loaded down with 20+ grams of sugar (or worse--artificial sweetener) like some of the "yogurt" you buy at the store. 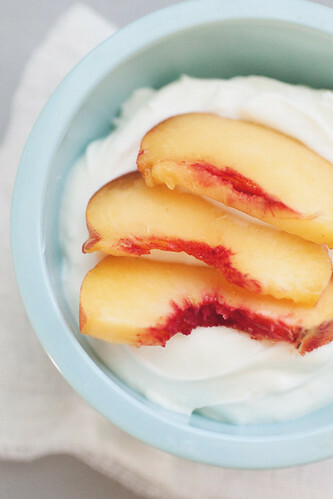 Yogurt is full of good bacteria that your body needs to balance out the bad, as well as a good sized serving of protein and an healthy dose of calcium, B vitamins and vitamin D.
Yay! Good job! I started making my yogurt a couple of months ago, using the delicious whole milk we buy from a dairy down the road. :) Isn't it wonderful? I actually do it in my crockpot to avoid burning. Here is my method: pour half a gallon of milk into the crockpot, and "cook" it an hour and a half on high (till it reaches 180 degrees). Let it cool about two hours (till it gets between 105 and 115 degrees). 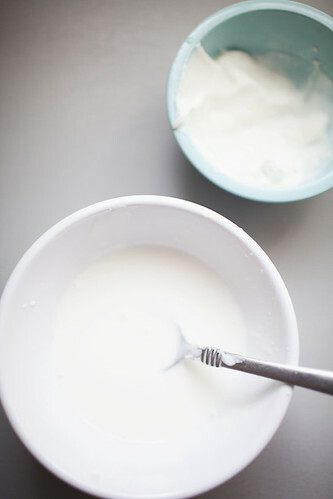 Whisk in 1/3 cup yogurt and 1/4 cup dry powdered milk, which really helps with thickness. 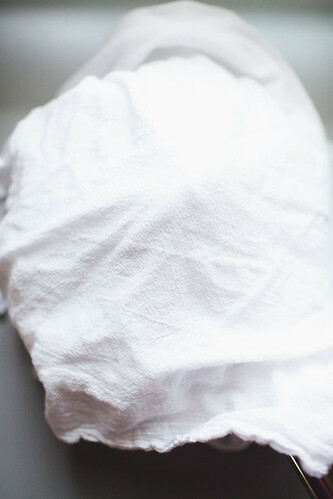 Wrap in towels and incubate in a warmed oven overnight, anywhere from 8 to 14 hours. Tada! & I don't think its a weird thing to do, but maybe that says something about me, too. My neighbor made her own yogurt and I though it was weird. I think she used a special machine or something though. The plain sounds more tasty. I think i just have a fear of doing something wrong with dairy and it making everyone sick. :) It looks delicious though! yum, yum! i just started making my own yogurt too...it is so exciting! i love how easy it is and how much money i save. i have been doing mine in the crockpot too and it's so super easy, completely hands off. i was actually just posting this recipe on my blog! my family blog is private but if you'd like an invite, i'd love to invite you! I LOVE making yogurt. Yum, yum. As always, your pictures are incredible. oh, this girl is DEFINITELY okay. i'm so excited for you! hooray! and i was just thinking i need a little more bacteria in my life. this is perfect. i've been thinking about doing this for a while, but have been intimidated.. so i've been putting it off. but you make it look so easy and yummy! Don't let these other people fool you, this is weird. It may be delicious, easy, and I may try it... but still weird. i bought a carton of plain yogurt last week so i could try making my own as soon as it's gone. for real. ps i made home made grahams this summer, too--a couple of times. it was a slightly different recipe than your recipe, but we did it at pretty much the same time. now THAT's weird. the home made peanut butter was what killed me, though. have you continued that? Yum!!! I love making yogurt! I haven't been able to get mine as thick as yours looks, though. :( Maybe I just need to be more patient. P.S. The whey is super nutritious -- use it in your baking! Even though it will mean my sweetie will think I am a total hippie nutjob. The comments are cracking me up. Whats sad is that when my mom did this a couple of years ago and was trying to talk me into it, I thought it sounded icky and never did. Now that I see it with your glamorous photos it looks really good! I'm gonna do it. Jarom is a yogurt fanatic and I've always wanted to try greek, but couldn't justify paying $1+ per cup. My mom will be so proud. Ok, Sheena, you have me convinced that I might actually be able to pull this off. I want to try it! I can't wait to try this! I love Greek Yogurt, but it is pretty pricey. This seems easy enough that even I can do it! Like homemade butter, it is so basic (and readily available at the store) but there is something so satisfying about making it at home. i've been meaning to do this for ages! this is the push i needed. Okay. I am SO glad you said something about this yesterday! I'd been toying with the idea of trying this for several months, but some of the methods/directions I'd seen online just seemed a little TOO complicated for me. ENTER Sheena! I whipped up my first batch last night. I've been watching the clock all day and actually drove home at lunch to pull it out of the oven and start the straining process in the fridge. I can't WAIT to get home tonight and try it! $1.39 for a 1/2 gallon of yummy yogurt. I win! You win! We all win! why in the oven with the light on? what does that do exactly? britt, because yogurt is afraid of the dark. bwahahahaha! Its just enough to keep the oven warm....I was actually surprised at how warm the light kept it! Do it!!! Do you guys like yogurt? i keep seeing posts like this that remind me that i really need to try this with almond or rice milk (we're pretty much dairy free). you've convinced me. I got a yogurt maker for one of my wedding showers and I have yet to use it. Your post has got me excited now! I'm going to try it this weekend. And then I'll have fresh breakfast all week. Yummers. yummm! When I was on a mission, we had some elders who used to make their own yogurt (give a hungry guy a limited amount of money, and he gets creative). But they just left it out on their counter... is that gross? also, just watched that 120 journey clip you posted. almost cried. thnx for sharing. What's the difference of our yoghurt and yours? This is why I love your blog so much... stuff like this! I'm trying it today. Thanks! So, for some reason (which I can't really explain), I was seized with the desire to make yogurt, I remembered you posting about it, and I followed your directions and made some on Sunday. I'm wondering if you've continued to make it regularly. See, the thing is, I'd like to make it a couple of times a month, but the idea of leaving my stove light on for 16 hours two times a month makes me a little nervous. I'm sure that stove lights aren't accustomed to getting that kind of use, and if I end up burning it out with all my yogurt escapades and have to pay a technician to come fix it, then all my saved funds go down the drain. So, since you're the one that got me into this mess, I thought I'd check in with you and see if you'd already crossed this bridge by chance. Regardless, thanks for the recipe. My only regret it that it took me so long to try. I think this is great and can't wait to try it. But I'm curious how much the light in the oven plays into making this. As I don't have a light in my oven I'll be sad if it's a requirement in the making process. But still a very cool idea that I hope to one day try out! I have been making my own yogurt...thanks to your blog pot! Thanks for the inspiration!I love making it and especially love all the money I'm saving! I wrote how to post on my blog and linked your original instructions, although I did change a few little things! I have a question. 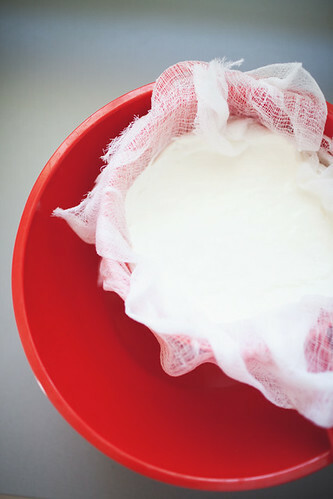 When are straining it through the cheese cloth for 6-8 hours do you need to put it in the refrigerator or do you leave it out at room temperature? I'm excited about this! I want to know the same thing healthandwellness asked, do you strain it through the cheese cloth in the fridge? I'm so thrilled about this idea and can't wait to try, thanks! Yes strain it in the fridge! I just made this yogurt today and it is delicious. I had bought a yogurt maker with no success but this recipe is so easy and it turned out great! Thanks so much for sharing. My mom always made homemade yogurt - as did her mom and her mom before so it was a no-brainer for me. I do it a bit differently though with almost exact results. I bring my milk to a boil. Then I place the pot on the side to let it cool (about 25-35 mins - usually while I make dinner or prep kids lunches). Then I add in a few spoons of yogurt, put the lid on the pot, wrap it up in 2-3towels (depending on how thick they are) and leave it overnight. The yogurt will be made in about 6-7 hours. Then j unwrap no put the yogurt in the fridge for at least an hour or until I need it (this stops the yogurt making process). I strain off the whey, give it a quick mix, put it into a glass container bs that's about it. If the yogurt is too tart, then add less starter or let it cool down a bit more next time before adding starter. It's so easy peasy. No one in our family has ever put it in the oven. We leave it on the counter along the wall and that's about it. 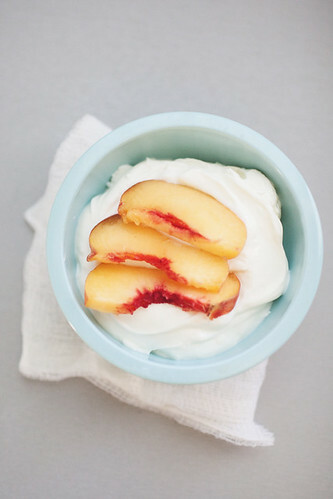 For the Greek yogurt, do you let it continue to sit out, or do you strain it in the refrigerator?